So many times I’ve written about Mancino’s…too many to even try to link back to all of them….and pretty much every time, I tell the story about how I got hooked on the sandwiches when I was in high school back in Illinois. We had a Mancino’s open near the big shopping area near me and ate there all the time. Well, guess what? Since I’m making you read about my vacation, at least here’s a tie in. That Mancino’s is still there…..and I went there with my family for lunch while I was home. Lucky you…. 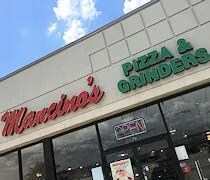 Mancino’s Pizza & Grinders has two locations in Bradley. How are they related to all the other Mancino’s stores? I have no freakin’ clue. Just like I have no freakin’ clue how all the Mancino’s in this part of the country are related either. The original Mancino’s in Bradley is on (Illinois) Route 50 or Kinzie Road. This used to be a great location in front of a Walmart in what is one of the most trafficked roads in Kankakee County. Walmart bailed a few years ago opting to build two Supercenters on opposite ends of town to replace the one regular Walmart store that had been in Bradley for as long as I can remember. This still isn’t a bad location. It’s still on one of the most trafficked roads in Kankakee County. It’s in front of a Hobby Lobby now and the next parcel over Meijer is tearing down an old Super K-Mart and building it’s first area store. Plus, one of Kankakee County’s big employers CSL Behring is right across the street. L and I were still at my parents house for one more day and my mom wanted to take her to a children’s museum in Bradley. We timed it so we could meet my brother on his lunch break too. He works in Kankakee….not far from where this Mancino’s is. Once again, my parents asked me what I wanted for lunch. Me. The guy who hasn’t lived there in 18 years. At first, we had decided on Arby’s because it was close to my brother and quick. As we were leaving, I asked if Mancino’s was still open. They said it was and said they haven’t been there in a long time. I asked if we could do that instead and since my brother was on board, no one had a problem with it. 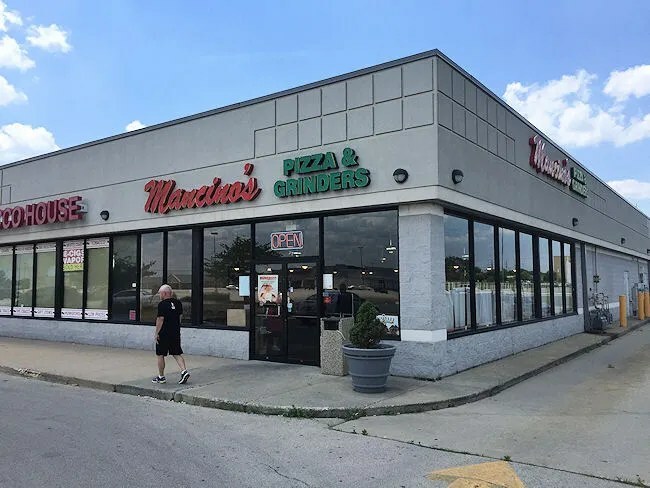 The Kinzie location of Mancino’s Pizza & Grinders in Bradley is part of a multi-tenant retail building in the shape of a square. There used to be a Starbucks in the part of the building that faces Kinzie, but that’s gone. Mancino’s is on the backside of the building facing the Hobby Lobby. I think the only business left in the building are a Cricket Wireless, a tobacoo store, and furniture store. There’s a small parking right in front of (or behind…depending how you look at it) the building. I started to pull in there, but my dad startled me and asked where I was going. We typically park in the lot next to the space that is actually for the building. There’s a drive through (not being used now…used to be for Starbucks) that separates the building from a large parking lot for what is now a Texas Roadhouse anchored building that is similar to the one Mancino’s is in. We timed it pretty well with my brother getting there as we were walking in. I’m pretty sure the restaurant hasn’t changed at all since it opened in 1995. There is a decent sized dining room with the kitchen and order counter in the back. Everything about the place looks and feels the same to me as it did 20 years ago when we ate there all the time. It’s been several years since my family has eaten at a Mancino’s so they all grabbed menus. I grabbed one to find something for L because she said she didn’t want the lunch grandma packed for her. She wanted me to order her something. Knowing that she hasn’t been eating at restaurants lately, I was hesitant, but I ordered her a piece of garllic cheese bread. I just got one slice so it cost under $2 and I would eat it if she didn’t. I ordered what I always order from Mancino’s no matter what name it’s under or what state it is in. 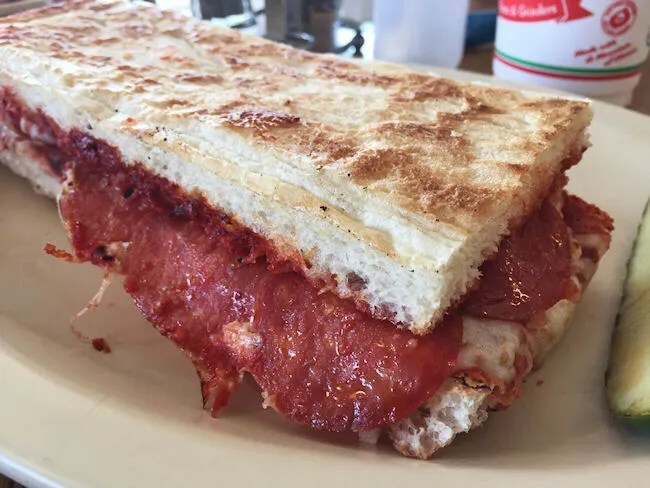 The Pizza Grinder is one of my all time favorite sandwiches. It’s such a simple sandwich of pizza sauce, mozzarella cheese, and pepperoni, but it a simple combination that lets the bread be the star of the meal. I really don’t know what it is about that bread, but damn is it good. A generous portion of pizza sauce and mozzarella cheese just highlight the buttery, crispy bread. Maybe it’s the nostalgia talking, but that was the best Mancino’s sandwich I’ve had in a long, long time. My mom and brother both ordered the same thing….mostly because my mom couldn’t really narrow it down so she trusted my brother’s judgement. They both ordered the Cowboy Steak Grinder. This sandwich comes with steak, bacon bits, giardiniera, chipotle ranch, cheese, lettuce, and tomato. Both really liked it which surprised me because my mom isn’t always a fan of heat. My brother mentioned it had been a long time since he’d eaten at Mancino’s and was glad I suggested it. He really liked the sandwich he got and may start working the place in to his rotation. My dad ordered the Steak Grinder. This one comes with sliced steak, mushrooms (he left off), onions, green peppers, cheese, lettuce, tomato, and mayo. Not hearing anything from my dad is always the best compliment and that’s what I got from him this time as well. All four of us got half sandwiches which came out to right around $35 with drinks and L’s garlic bread. It was a little odd for all four of us to be eating at a place that we ate at so many times when my brother and I were in high school. Now, the four of us, with my brother and I as adults along with my daughter, got to eat another meal in a place we all really liked growing up. There’s not many places left in the Kankakee area that are exactly the same as they were 20 years ago. A lot of our favorites have closed down, moved, or remodeled to the point it doesn’t even look like the same building. Mancino’s is just the same as it was 20 years ago. It was delicious then. It’s delicious now. There’s no reason for it to change.